The theme for DESC’s Professional Development programme is “Getting better and making a difference” with all staff taking on the responsibility for developing themselves and wanting to engage because it is beneficial, rather than participating due to accountability. Accordingly, my own pedagogical ”to do” list for this term consists of two personal objectives, firstly to further embed ‘Four to grow’. This is the medium through which we equip our students with the skills they need to succeed and secondly to support my students in ‘getting better’ at analysis. What follows will hopefully be a series of posts where I reflect on teaching English..
Insert here my dilemma over sticking to the rules/conventions! Lately I’ve been thinking in abundance about structure and how we teach students to make their writing more analytical. 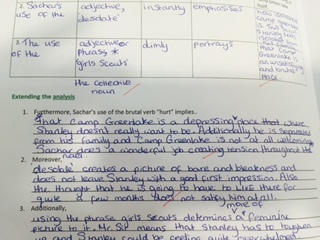 Most schools rely on P.E.E or a variant to help scaffold writing. When ideally what we’d like is for students to develop their own personal construction for analysis, become more adventurous and thus more creative in the way they connect with literature. DESC’s English Dept use SWEATY as our mnemonic for building better written responses. Key is the modelling process and worked examples, it is so important for students to see and hear my own thinking process as I write, rather than just putting a model answer in front of them (though I do, do this too and deconstruct the steps it takes to get to such an answer). Through this process of seeing the teacher thinking out loud, I want students to see me making mistakes, self edit, cross out unnecessary information, move my words around and so on, in response to a text. Thus giving students more confidence in their own writing, reducing cognitive burden and providing them with ideas to build upon. Following some thought provoking conversations with colleagues, I have been experimenting with different ways of scaffolding the statement/weave/analysis. Dividing the statement into three parts and weaving in the evidence/analysis, using a step by step process, giving students an array of adjectives and discourse markers to make their writing more elaborate. 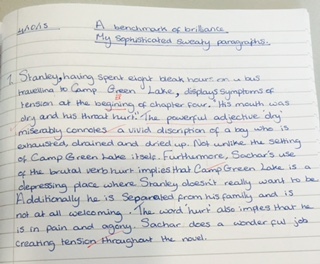 Whilst the results of the above were impressive, I felt that with some of my earlier attempts in assisting students with writing SWEATYs, that I have focused too much on the structure, potentially over complicating the process for some students. What we want is for the learning to truly ‘stick’. So alternatively I thought about abandoning the structure, or instead concentrating on the most salient part of the SWEATY, the ‘A’ or analysis. My inspiration came in the form of a picture I saw on Twitter which was a thinking line or arrow. 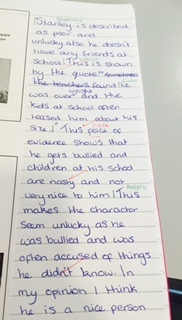 You get the students to draw an arrow in their books, place the quotes along the middle and annotate their line of thinking around the outside, gradually developing their argument. The results of this so far have been far more deep and nuanced analysis and importantly evidence of independent thought. Completing the analysis prior to attempting to write their SWEATY, leaving the working memory unimpeded from excessive strain. 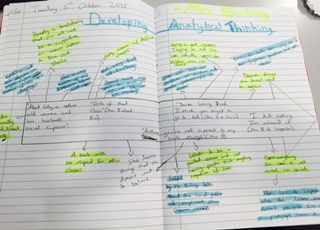 Whilst ideally we want students to eventually independently develop their own personal response to how they develop analysis, this is an area where some prompts as to what to include are useful. 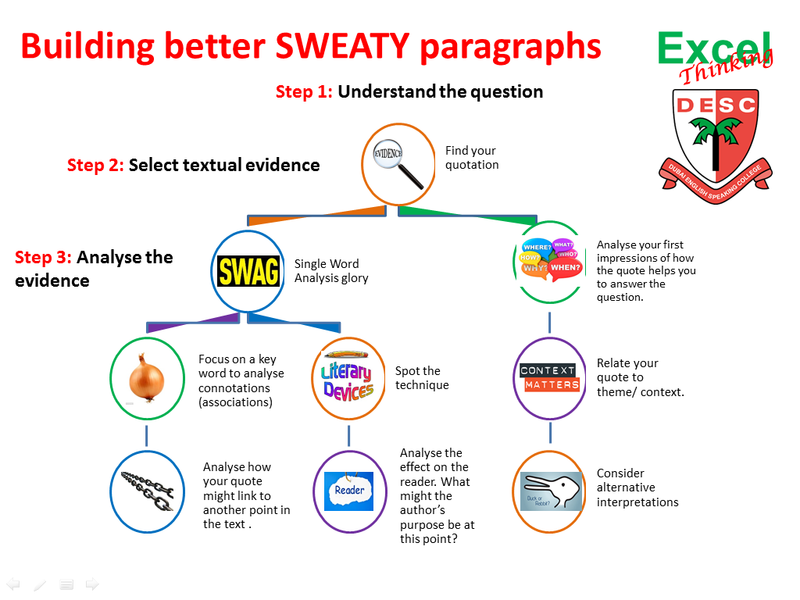 So enter SWAG (Single Word Analysis Glory) and a little flow diagram to support students with extending or knowing what to include in their analysis. Close word analysis followed by a number of options to develop this further. Introducing this had a mixed reaction, a couple of giggles and no doubt the odd ”embarrassing old person tries to get down with the kids” type cringe. Though I am delighted with how quickly it has become embedded. After a couple of lessons using it, I overheard two year 8’s talking, one said to the other, ”what have we got to do?”. The other responded ”she wants us to SWAG it”, the realisation and recognition on the first student’s face of what they needed to do left me satisfied that the mnemonic and the meaning attached to it will stick. This forthcoming week is going to be particularly intriguing as all students Yr 7-9 will be sitting a Section A style question from the new GCSE Lit paper. In the absence of the scaffolds, will students continue to independently apply the principles they have learned?